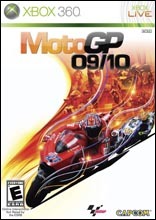 <br>MotoGP 09/10 takes the series in an exciting new direction rewarding you for your racing style and skill on the track. You will get all the riders, tracks and teams from the official 2009 MotoGP season AND free downloadable content from the 2010 season as it unfolds. The free update means you will be able to play the most up to date MotoGP season content earlier than ever before. MotoGP 09/10 will feature an all new 'Arcade' mode where you must complete different race challenges before the time runs out. Time bonuses will be awarded for those who take risks on the track but losing concentration will mean you face time being deducted making this an exciting gameplay addition for racing game fans. Run out of time and your chances of living the MotoGP dream will be over. Complementing Arcade mode is the introduction of a fully realised 'Career' mode which provides an expansion to the MotoGP experience. Players take control of their MotoGP championship both on and off the track competing in the races and managing their team as they try to build their career as a racing pro. You can compete in a full championship season across all three MotoGP bike classes and pit your skills against players around the globe with the robust online mode.